ANTHONY JOSHUA will come out on top against Jarrell Miller, but it won’t be straightforward. That’s the verdict of Joshua’s protege Lawrence Okolie, who believes Miller will do whatever it takes to ‘bust up’ the unified heavyweight champion. Joshua goes head-to-head with the loudmouth American at Madison Square Garden on June 1. In order to retain his WBA ‘Super’, IBF, IBO and WBO titles, he will need to inflict the first defeat of Miller’s career in New York. Many feel it will be a walk in the park for AJ, yet Okolie insists his long-term mentor won’t be in for a comfortable night. “It will be a good win, but it won’t be comfortable,” he exclusively told Starsport. “Physically, Miller’s such a big guy and he’ll be coming all in. “Grappling, heads, doing whatever it takes to bust up AJ. Okolie, 26, has claimed victory in all 11 of his professional contests to date - with eight coming by way of knockout. The Hackney man is a force to be reckoned with on the domestic scene, picking up the British and Commonwealth titles in wins over Matty Askin and Luke Watkins, while also collecting the WBA Continental strap in a bragging-rights triumph over bitter rival Isaac Chamberlain. Yet, as well as making a name for himself at cruiserweight, Okolie has also sparred numerous rounds with elite-level heavyweights. 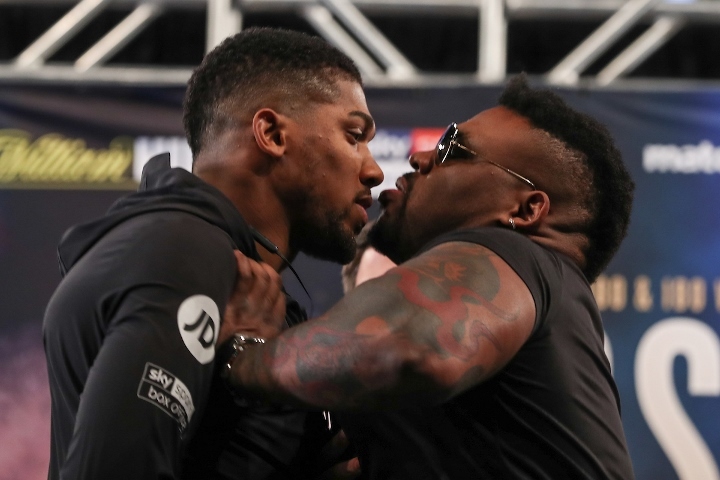 He has locked horns with Joshua on several occasions, but most recently ‘The Sauce’ shared the ring with Tyson Fury ahead of his controversial split-decision draw against WBC champion Deontay Wilder in Los Angeles. “I feel like we both left camp with learning,” he summarised when recalling that spar with the ‘Gypsy King’. “I was dealing with a taller opponent, a tricky opponent. Fury, he had to deal with my speed and athleticism. “So it was good all round. It was good to see how he works. For many, a showdown between Joshua and Fury would be the biggest domestic clash of all time - and potentially one of the most iconic sporting events in history. And while remaining coy about such a matchup, Okolie admits he would have to favour his manager if it went ahead. “They’re both world-class fighters and it’s all about who can do it on the night,” he said. [QUOTE=Jkp;19600304]AJ already has fight booked you tool. Hes fighting that fat slow bum called miller. [/QUOTE] WTF does Wilder ducking have to do with AJ fighting? Seriously fellah, give yer head a shake. [QUOTE=15 Rounds again;19600292]The offer wasnt from AJ you tool. It was from DAZN and their condition was he fight AJ. [/QUOTE] AJ already has fight booked you tool. Hes fighting that fat slow bum called miller. [QUOTE=Jkp;19600137]AJ already has a fight booked ya moron. How can he be making real offers to Wilder when he has fight booked? [/QUOTE] The offer wasnt from AJ you tool. It was from DAZN and their condition was he fight AJ.